Laura Chiorello arrived in Santa Cruz County in 1992 as a UCSC student and has never left! After earning her MA in Education, she began teaching in the Soquel Union Elementary School District. Over 13 years, she taught students in grades 4-8 everything from science and health to humanities, but some of the most fun she had was running with her students. A SCTC member since 2005, Laura has been a triathlete and a runner for 15 years, completing 3 marathons, two Olympic distance triathlons, and countless half marathons, sprint triathlons, 10 milers, 10K's, 5 milers, and 5K's. Her proudest moments have been placing in her age group in local races. Not a naturally fast runner, Laura works hard at it every week and always finds joy in the process of learning to be a better athlete. 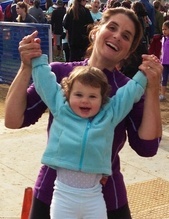 She lives in Soquel with her husband, Jeff, also a SCTC member, their three year old daughter, Vivienne, who never stops running, their hyper border collie, Zeke, and their highly energetic Siamese cat, Soobie. Javier Naranjo has been living in Santa Cruz County since his teen years, and attended Watsonville High School. He started running when he was 17 years old and has kept going ever since. He attended Hartnell College and competed at State Championships in cross country and track. Javier has participated in hundreds— if not thousands— of road races, placing 2nd and 3rd at IBSM. He has won many local and state races and has consistently placed in the Top 100 at Wharf-to-Wharf in the last 20 years. Javier is a CIF-certified coach, and trains students at Soquel High School. He started coaching the SCTC youth cross country program in 1999 and has been taking kids to the Junior Olympics ever since. This year he has launched a new project with SCTC, Camp Track Team, for athletes that he considers ready to move on to the next level. Many of the kids Javier has coached have successfully transitioned into competitive running programs at the local high schools. He is proud to have played part in the lives of many young people, and hopes to continue passing on the experience he has gained in from his years of running. Javier can be contacted at (831) 295-4231.